1) The food is amazing. I can rarely say I’ve never had a bad meal when I’m taking about restaurants, but this is one of the very few I can say that about. 3) The restaurant itself is teeny tiny…teeny tiny in the best way possible, with only a handful of tables. It’s always so intimate and cozy in there; perfect for a date night. 4) They have some of the most personal, friendly staff you could ask for, with amazing service. Anyways, this place is known for a few things, there pastas, their caesar pasta salad (yea you’re reading that correctly) and last but not least….their creamy.tomato.basil.soup. This soup is like punch yourself in the face good. I don’t know what it is, but there’s SOMETHING about this soup that sets it apart from every other tomato-basil soup. Now that the weather has started to cool down here in LA it’s finally getting to be appropriate soup weather which gets me so excited not only for this soup, but to be able to start wearing chilly weather clothes again….scarves, boots, cute jackets, yay! Okay, back to soup… I’ve made this dozens of times and think I finally got it close enough to The Noodle’s version. 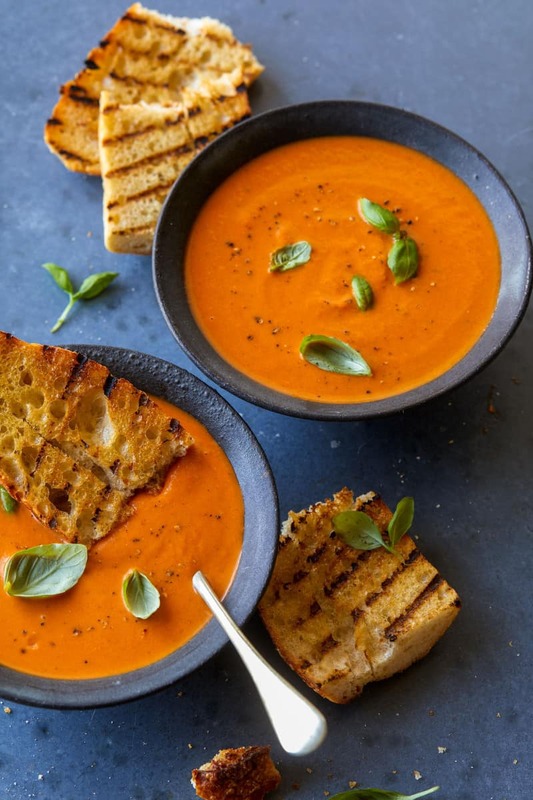 I hope you all enjoy this Creamy Roasted Tomato & Basil Soup as much as I do…I mean who doesn’t love tomato soup, right?! 2. Spread tomato halves onto a baking sheet and drizzle with olive oil. Season with salt and pepper. 3. Roast tomatoes for about 1 hour. 4. While tomatoes are in the oven, melt the butter in a large pot over medium-high heat. 5. Add onion and sauté for 5 minutes. 6. Stir in the garlic and thyme and sauté for another 5 minutes. 7. Add crushed tomatoes, basils and sugar. Season with salt and pepper. 8. Stir the mixture and reduce the heat to medium or medium-low and simmer for 10 minutes, covered. 9. Pour broth and roasted tomatoes into the pot. Season with salt and pepper. 10. Continue to simmer soup, covered, for about 30 minutes, stirring occasionally. 11. Carefully pour soup into a blender and blend until smooth. 12. Pour soup back into the pot and stir in the cream until fully incorporated. 13. Simmer the soup for 3 minutes before ladling into bowls. 14. Top each soup with a sprinkle of goat cheese and fried basil and serve hot. I’m weak. Like, seriously weak. This is my next soup. Holy crap, I can’t move. GORGEOUS. Just made it. So easy & really tasty. I didn’t have canned crushed tomatos so I substituted 1 can tomato sauce & a little water. Plus, I used home grown Beefmaster tomatos quartered. Came out great! Ok, it’s settled. I’m making this TONIGHT. I LOVE creamy tomato soup, and this sounds divine. Also, side note, yes, I’m staying home on a Friday night to make soup.. My license says I’m 24 but really it appears I’m 74. You decide. Are you kidding?! That sounds like a pretty amazing Friday night to me! I’ll be 74 with you, nbd :) Hope you like the soup!! Sounds like a FANTASTIC Friday night to me! And I’m 25! Right there with you! I’m 24 and i was gaga to make this, turned out SOO good! And I’m 20… I’m spending my Spring Break at home, cooking all of these delicious recipes. I’m 45 and I just made it tonight coupled with homemade french bread, hot bacon dip and coconut mousse for desert I don’t have feta in the house so I’ll just plunk some parmesan on the table for whoever wants I would think sprinkling blue cheese on this would be great too. I tasted it and it’s amazing wow thanks so much for posting. Ok, I’m not the biggest fan of a tomato, but this – this is glorious. Roast it, add some herbs, heavy cream and goat cheese – gimme gimme! I want a bowl of this with a grilled cheese sandwich. On a dark rainy evening, comfort in a bowl; hot homemade soup with nice crusty bread. I have some strangling odds and ends of tomatoes and basil that need a touch of luster and this recipe is perfect. This soup is to die for…. 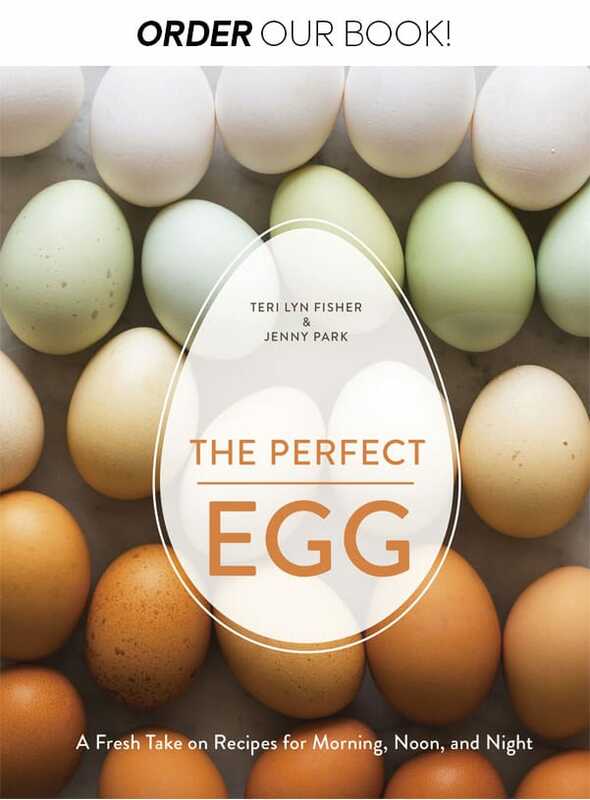 Simple food and food photography at its best. Glorious and oh so clever. This soup is pretty and soo yummy looking! This makes me want to hunker down at home with a bowl of soup and an America’s Next Top Model marathon in the background. (My guilty pleasure is eating comfort food while watching that show). Love your blog–photos and food are both incredible. I linked to one of your recipes this week in my blogger potluck. If you’d like to check it out, you can find it at http://www.muchtomydelight.com/2011/10/blogger-party-potluck-spooky-supper.html. I am so enticed by your photo of the roasted tomatoes! 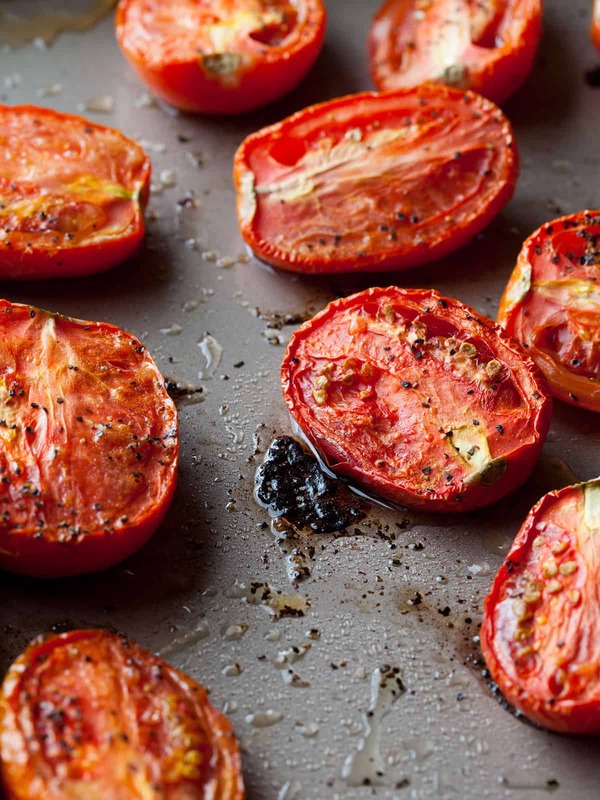 I looooove tomatoes, and roasting makes them sweet, tender, and perfect for soup. Can’t wait to try this. I made this soup last night, and it turned out amazing! I had never made tomato soup before…and even thought I didn’t like it. But I saw this post and it looked so yummy I had to give tomato soup another try. It was pretty easy to make too! I did a little step by step of this recipe on my blog, http://www.amandakbythebay.blogspot.com. I linked back to your site a couple of times of course! Thanks again for the awesome recipe! Wow! This soup looks like all kinds of amazing. Yum! 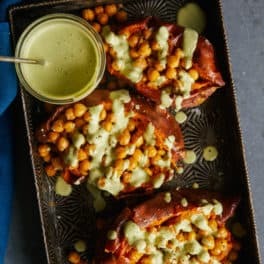 This sounds so delish! 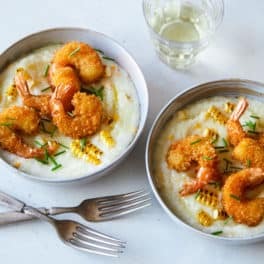 I am making it tomorrow night. 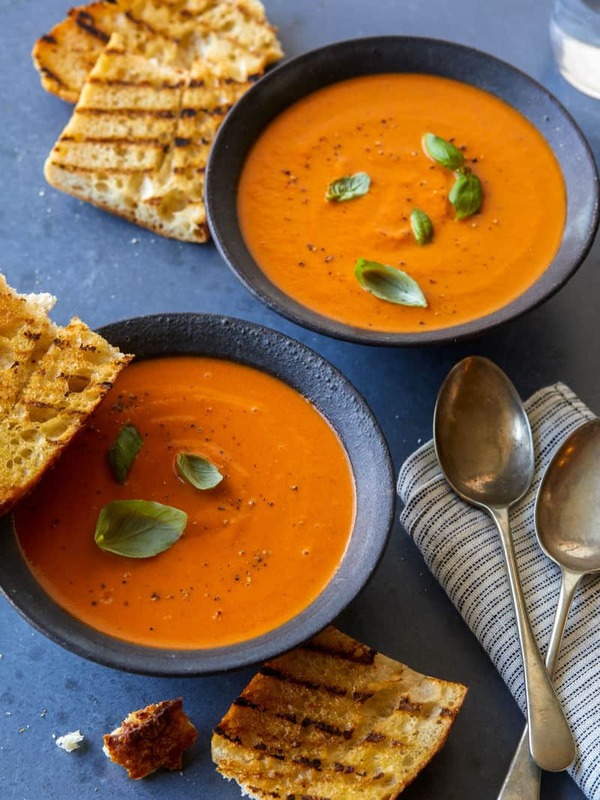 My husband and I and our 3 little kiddies had the most delicious tomato soup EVER skiing in Switzerland at a little tiny hut….I’ve been trying to recreate it ever since and have tried 3 or 4 recipes in several different ways…but, this looks like it could be it. Yum, yum. sounds amazing, will have to try it out as soon as I find basil on these islands! I made it Friday night and it is fantastic! Almost just like one I love from a local deli. I wasn’t in a goat cheese mood, so I made parmesan crisps and crumbled them over. So good! Match made in heaven! Basil really goes very well with any type of tomato dish. Hot or cold tomato dish, name it…Basil has to go there somewhere. Lovely soup recipe…will definitely try! Oh, wow, this is so beautiful! Just used the last of my homegrown basil, but I will find some more to make this. And I love the bowls. It must be tomato soup season. I just made some myself, and I’m eating the leftovers right now! I love the idea of roasting some of the tomatoes for the soup, AND using butter. Mmm, butter. And I love your beautiful photos. You have a beautiful site…just “stumbled” upon you. Great recipe! This sounds awesome! Hopefully I can get my hands on some good tomatoes and try this soon! yum yum yum!!! Roasted tomatoes are my absolute favorite! I cannot WAIT until the weather gets cold down here in Texas! Can’t wait to try it out when it gets colder around here. Yummy, tomato soup is my favorite. This looks FANTASTIC! I am going to make some small tweaks on my end, but thank you so much for the post. Yum. Yum. This looks awesome. It’s warming up now in Sydney, but there’s still cool evenings for a healthy soup like this! 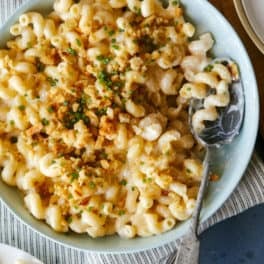 I am making this right now, and I must say after a few tastings, and half of my goat cheese gone (the gf wont stay out of it) This is going to be fantastic. I am also serving it with my ultimate grilled cheese: swiss, cheddar, provo, tomatoes, bacon mayo on texas toast! absolutely beautiful pictures! i can’t wait to make this soup with a grilled cheese sandwich!!! Thank you for this delicious recipe! I am a tomato soup FANATIC…it is my ultimate comfort food. I looooove cooking soups in the fall and am always trying out new recipes. I was looking for a yummy fall dish to curl up next to by the fireplace on Halloween while the trick-or-treaters stopped by. I’ve made homemade tomato soup many times but never thought of roasting the tomatoes…let me tell you, it makes a huge difference in flavor! This was so yummy and really hit the spot! The goat cheese on top is a fantastic twist. Cheers! I have never cooked with heavy cream before so I was wondering when you pour the cream in, do you whip it first or just pour it in in the liquid form? Nope, no whipping involved. Just stir it right in! Made this soup last nite and it’s fab! Only had 1 lb Roma tomatoes, so I used 1/2 lb cherry tomatoes (only roasted those about 30 min) and it worked great! Thanks for such a nice recipe. I just bought glass containers so I can make this soup again and freeze them for later. One of my fav soups EVER!!! 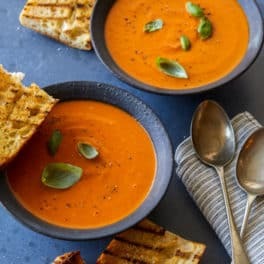 Tomato is always the go-to soup of choice and this was ridiculously easy to make – so much better tasting and for you than canned. thank you!! Finally got to making this and it was FANTASTIC!!! Thank you! I cant wait to try out this recipe. It looks great. Thanks for sharing. We made this last night, and it is the BEST soup ever! We’ve already posted the link on Facebook and friends and family will be making it this week too. You grew up near The Noodle? Me too! Did you go to New Trier? Small world! This looks delicious! 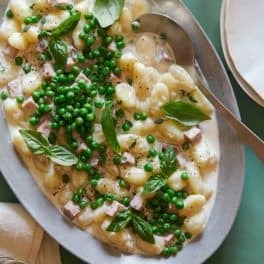 1 – Even though I was dead set on making this on Sunday, when I went food shopping on Saturday, the supermarket did not have ANY fresh basil (it is winter after all). Given the selection of fresh herbs I had to choose from, I went with tarragon. I used one good handful in place of the fresh basil and it really added a nice flavor to the soup. 2 – I added only 1/3 cup of heavy cream, and I think that’s all it needed really. Maybe even 1/4 cup would suffice and still make for a nice and creamy soup. Just made this (Yes, it is 1am.) And holy moly it is delicious. I added a little fresh grated parmasean to it, but otherwise kept it the same. SO DELICIOUS. I can’t wait to eat a big bowl of this with a grilled cheese made on my roommates fancy shmancy grilled cheese maker. Sounds like a perfect Friday night to me. I made this last night and it was delicious!! LIght on the tummy but very satisfying. Ive now got TWO soup recipes which i’ll be making often this coming winter (pumpkin was the other one). I just made this. delicious! great job. i will be using your website more often. 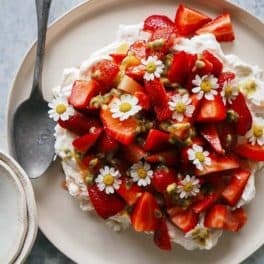 Trying to find recipes so that I can use my plethora of tomatoes from our garden I stumbled upon this recipe and can’t wait to try it. I’m not going to use roma tomatoes, but instead a selection of heirlooms….I hope it works!! Two thumbs up! We made this last night and it was delicious!! We just used the ugly “canners” from the farmers market because they were a dollar a pound and used milk instead of cream. We served it with pesto grilled cheese. Yum! Thanks for the great recipe! Made it. Loved it. Actually made a double batch! I need some freezing instructions for the tomato basil soup. Leave out the fried basil and goat cheese when freezing and add when serving? Any other freezing tips? 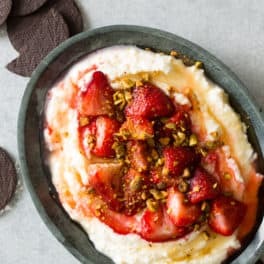 Can you post directions to making this in a Vitamix? All the instructions are the same, you just sub out your blender for vitamix! I have a vitamix and it’s my favorite thing to purée with! Oh YUM. Just made this with only a few student budget/diet tweaks and it was delicious. Added some piment d’Espelette for a little kick and it mixed really well with the basil. The pot is still full and I can’t wait for tomorrow to have some for lunch! This turned out great! I used veggie broth to make it vegetarian. Next time it will definitely get paired with grilled cheese. OMG!!! I made this soup yesterday, WOW!!! 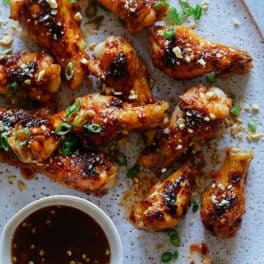 Great taste & very easy to make. I left my soup a little chunky. I will make this again & again. Yummy recipe! Is that a fried basil leaf I see? Flash-Deep frying basil leaves are absolutely DIVINE, when you add them to an egg-white breakfast taco…MMM Jam packed with flavor! I live in the town you grew up in and my entire family loves that soup. They opened a small shop next door where you can buy the soup out of the cooler and heat it up at home for dinner. It’s the best tomato basil ever. I make a close one, but will try your variety to see if it’s more dead on. The noodle rocks. I made this soup and it was amazing! I added chopped crispy bacon as a topping and it was perfect! Thanks for the wonderful recipe! I have made this too many times to count [paired with grilled cheese it is my boyfriends favorite meal ever]. Thank you for such a wonderful recipe! OMG! falling over with how great this tasted!!! I had to comment, LOVE,LOVE,LOVE! This is the best tomato soup I have ever had. Am making it again for the second time. I make a big pot and I freeze it. 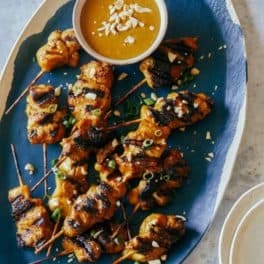 Thank you so much for sharing this recipe with us! It’s freaking hot here in Texas But I think i’m gonna make it anyway! I can’t wait til Winter! Looks good! I just made this soup!!! OMG!!! Everybody licked their plates!!! So good! 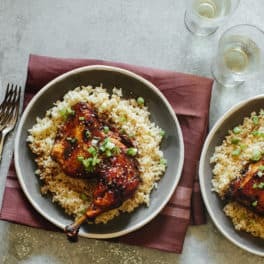 PINGBACK: 5 Recipes that are Perfect for Fall! | What do I make for dinner? receiving the payment. The runner has on a white t-shirt and dungaree pants. different coming from 1 entrance bell about the distinct additional. regarded with utmost care by the school. What a fantastic recipe. Will definitely try this! Tomatoes are always the best! Making this for my parents tonight! Looks lovely! I’m going to bake some pita chips for the side. Thank you for the recipe! This is my daughter’s favourite recipe for tomato sup, I love it too! The soup is amazing. Creamy rich and full of flavor. I love making this soup on the weeking with a gourmet grilled cheese sandwich.